Tullywiggan (possibly from Irish Tulach an Bhogain, meaning 'hillock of the quagmire') is a small village outside Cookstown, County Tyrone, Northern Ireland. It lies within the civil parish of Derryloran, the historic barony of Dungannon Upper, and is situated within Cookstown District Council. Excavations have shown signs of a New Stone Age and early Bronze Age settlement. ^ "Excavations.ie. Searchable database of Irish excavation reports". www.excavations.ie. Retrieved 2010-01-31. 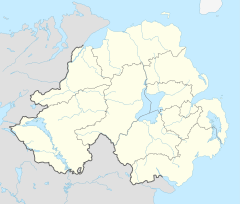 This article related to the geography of County Tyrone, Northern Ireland is a stub. You can help Wikipedia by expanding it. This page was last edited on 4 December 2017, at 18:27 (UTC).